Freshmen Wyatt Snyder, left, and Justin Hunt meet with Kyle Roe of Hord Family Farm, a Bucyrus-based livestock producer. Roe is a 2016 WC graduate who returned to her alma mater to recruit students for jobs and internships with her employer. 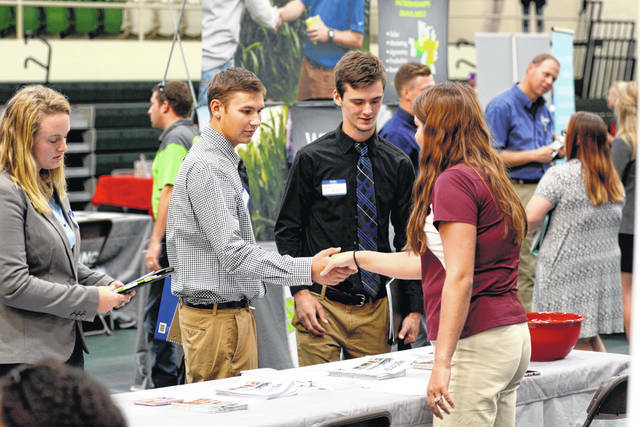 WILMINGTON — Students spanning the spectrum from seniors with graduation on the near horizon to new freshmen starting only their fourth week of classes all benefited from Wilmington College’s Career Fair Monday. More than 50 recruiters from business, industry, agriculture, higher education and non-profit organizations converged at WC’s Center for Sport Sciences for an event designed to introduce them to potential future employees, interns and graduate students, as well as provide students with an opportunity to get a foot in the door for landing jobs and internships. That point should especially speak to freshmen and others for whom graduation is still years away. Attaining a fulfilling career is a long process in which preparation is a key to success. She said students should research both their fields of interest and the most desirable employers in those areas in order to “really understand what you’re looking for and what companies are looking for. Talley has been working with students on preparing resumes, cover letters and building bullet points that would distinguish them from others seeking the same job or internship. She noted that WC’s hallmark for hands-on learning experiences often gives students a leg up on applicants from many other schools. Talley also urged students to not be dissuaded from speaking with certain employers by thinking its goods and services do not correspond to their academic major. Indeed, almost every organization, business and industry hires staff in areas ranging from human resources and accounting to communication, marketing, sales and government relations.